Our Coachbuilders Gallery is a continuously expanding overview of all coachbuilders and their numerous creations from past to present. The gallery now contains approximately 9.780 images. Time for an update! There are currently 68 coachbuilders and present in the gallery and a whole lot more on our to-do list. Thanks to the numerous contributions by our enthusiastic forum members, our Coachbuilders Gallery is rapidly becoming a very nice and extensive overview. 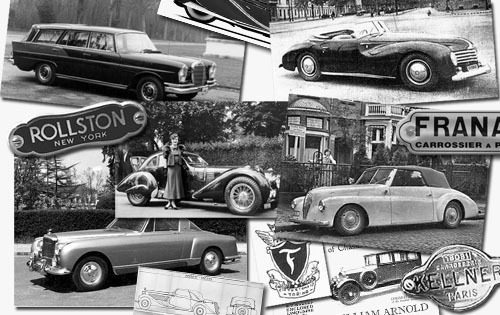 However, our forum contains numerous topics about a whole lot more coachbuilders. All the information and photos collected there will eventually be sorted and find its way to the gallery. We've just made a start with the Akkermans gallery. This Dutch coachbuilding company still exists, but very few of their classic cars are known. Their modern creations will not be uploaded, because they are all ambulances and utility vehicles for commercial companies, the army, the police and the fire brigade. If you have any more info and/or images of cars bodied by Akkermans, please mail us or become a member of our forum and contribute anything you'd like to share with us there. Three more Dutch coachbuilders have been added or updated: Schutter & Van Bakel, Van Leersum and Van Rijswijk. Some Fiats and a Lancia have been added to the Allemano gallery and some nice studio shots were added to the gallery of Bertone's Ferrari 250 GT SWB #1739GT. Bertone's latest creation, the dramatically styled, Corvette based Mantide, is featured as well. The gallery of Boano's Ferrari 250 GT Coupe received some new images and you can now also find the exciting Raymond Loewy designed Jaguar XK140. Also check out the galleries about the Belgian coachbuilders D'Ieteren and Jonckheere and the gallery about Van den Plas of Brussels now also shows a nice Rolls-Rolls Phantom III. The Drogo gallery is updated with multiple pictures of various Ferraris, a.o. the 'Norinder GTO' and some period pictures of 250 Testa Rossa #0716TR. Furthermore, enjoy the galleries about Dubos, an Erdmann & Rossi Bugatti T49, Fantuzzi's Golden Ferrari Spider, a very nice Bugatti T55 Roadster by Figoni & Falaschi and a few Ghia Ferraris. Three Bugattis have been added to the James Young gallery and the Motto gallery now shows four Ferraris and two Renaults. The Park Ward gallery has been updated, of which Charles Ward's personal car, the lovely MG TA 'Symphony', is the most recent. The Scaglietti gallery now contains four specials: a series of three Corvette, a one-off Alfa Romeo and two one-off Ferraris. The gallery of Sodomka from the Czech Republic illustrates several wonderful Aero models and some interesting Skodas. In the Stabilimenti Farina gallery we uploaded a nice set of studio shots by Pieter E. Kamp of the Ferrari 166 Inter Berlinetta #037S and we found two extra photos of the no longer existing 1950 166 Inter Cabriolet #063S. Another Ferrari 166 Inter has been added to the Touring gallery. In this case it's the Coupe #017S, which until recently was part of the Schermerhorn collection. At the end of the list we find Vignale and Zagato of which several Ferraris are pictured and quite recently the Zagato Perana Z1 made its appearance. This update is just a quick summary of what's happened to the gallery in the last few month. It is very well possible several images that were added to existing galleries are left forgotten in this update. So there's always plenty to discover! When viewing a single picture in any gallery, it will first open in a size of 500 pixels wide. When you click on the photo again, it will enlarge to 670 pixels (if available) and after another click it will be shown in the largest size available.